With Christmas fast approaching I don't think we've ever been busier, with all the jumpers in full swing and the flat horses starting to trickle back in there's plenty in the yard to get excited about. My dad and I enjoy buying younger horses whether it be stores for jumping or yearlings for the flat, the small string of yearlings we have are coming along nicely. The Coach House and Music Master (pictured) are both very forward types and although I joke every year that we will have a runner in the Brocklesby, I feel this year there could be a little more chance of that been possible! Click here to see details of the Coach House and Music Master. 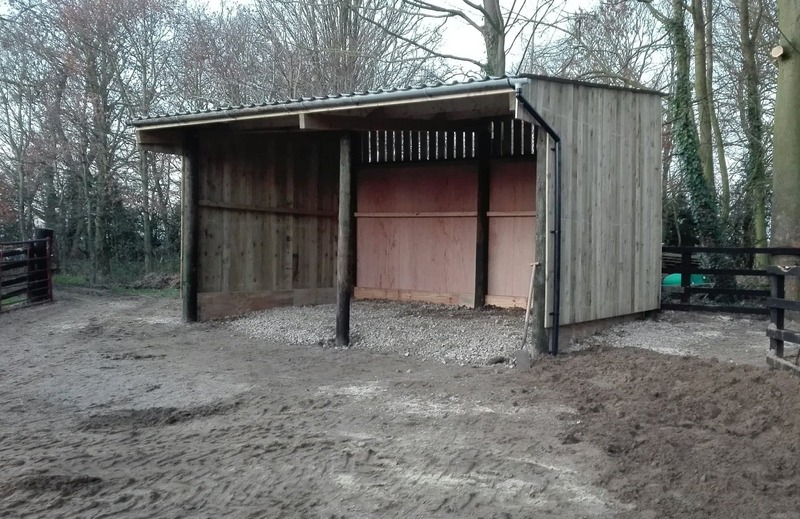 We're always looking for ways to improve things around the yard and one of our recent concepts was to turn one of our turn out paddocks into outdoor stabling, we put sand from the old gallop down and then constructed a field shelter/stable, I'm delighted with the result and Tony who built it has done a great job. I hope that it can be used to house horses with such problems as bleeding or respiratory issues. Below is a picture of the finished product. The last couple of weeks has seen some good efforts from the yard, Another Day Done ran a great race on his handicap debut at Wetherby to finish second. He's not the most straight forward but has relaxed and settled in to his routine very well over the last few months, he is partnered daily by Marcus (Haigh) who has done a great job with him, we should see him out again on Boxing Day. Miss Amelia ran a more pleasing race at Bangor, she shows so much at home so it was nice to see her show a bit of that on the track, a couple of juddering mistakes prevented her from finishing closer but she looks to be heading in the right direction. Cash To Ash ran another solid race at Southwell, a step up in trip maybe required for him. Carlovian has turned in to a bit of a legend now we've sent him sprinting, since we dropped him back to 6 furlongs in September he has run 10 times and only been out the first four on two of those occasions, he's a great credit to his owners but there's no rest for Carl as he headed to Southwell today where he ran a creditable fifth, I think he has earned his Christmas dinner!